Technology and new ‘devices’ are all the rage in the modern world. Everyone seems to want to discuss their latest ‘toys’ they use both in the workplace and at home. Here are some new technological break-throughs designed to make life easier for people with disability. The Kapten PLUS Personal Navigation Device This is another device which is designed to assist people with visual disabilities. It functions very much like a GPS device which helps the person who uses it just as someone would in a car, except they use it while navigating in person. This technology can really help a person navigate their way and plan a safe route to get where they need to go. Control is either by pressing buttons, or giving voice commands. Read more. 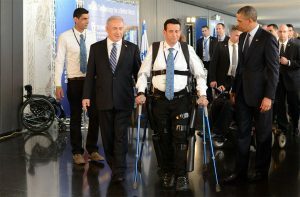 The ReWalk Exoskeleton This remarkable piece of technology was developed in Israel by an engineer, Amit Goffner. After an accident that rendered him a paraplegic, Goffner developed the ‘suit’ which enables people with spinal cord injuries to gain another level of mobility. It is already FDA approved, and in use for people who are paraplegics (but not quadraplegics). While this is FDA approved, it’s unclear how funding would be obtained for the exoskeleton. Still, it represents a new world for people who are paraplegics, and enables them to be more mobile than ever before. Read more. Technological advancements for people with disabilities are becoming more remarkable each year. Many of these technologies are opening up new worlds for people with disability, empowering them to live fulfilling lives, and increasing their level of independence. Most of all, however, they enable people with disabilities to live life on their own terms – to come and go as they please, to travel, etc. It is life as it should be.